This article will walk you through the process of how to set up the Add-Ons for your property in myfrontdesk. If you need to update existing Add-Ons or if you want to create them, please follow these steps below. Are you interested in this feature? Please, send an email to support@cloudbeds.com and we will help you. Before creating your Add-Ons, you should create an Item/Service first. Click on "+ New Item"
Enter the item Name (if it is a product then you can track stock inventory for it). SKU Number - Required (If you press the tab button in this section the system will automatically assign a SKU Number to item). Enter Item/Product Code, if necessary (optional). Category - Link the item to the designated category. If you don't have categories yet, click on "Create New Category." Mandatory Notes - If selected, you need to enter a note on every item you add on reservations. Price - Enter the price for a single item. If there is no price associated, select the box "This item does not have a price," this way you can enter a price manually when adding the item to a reservation. Add taxes or fees that will be associated to the item. If the taxes or fees are not listed, you will need to click on the link "CREATE/MODIFY TAX OR FEE." Do not track stock inventory - The system will update the quantity available whenever a transaction is posted. If you don't want the system to keep track of stock for a specific item, select this option. Stock quantity - Enter the quantity of the product that is currently available for sale at the property. If you would like to be notified when current stock quantity of the item reaches a specific quantity, enter the quantity here. If you do not want to be notified, leave this field empty. Threshold quantity should typically be lower than available quantity. Choose to stop selling the product if the remaining inventory quantity of this stock reaches below the value specified or continue selling even below 0 availability. Click the "SAVE ITEM" button to ensure that all transactions are saved properly. Add-on name (this will be displayed on the booking engine mybookings). Select Inventory Item (previously created). Charge Type: Select whether it is charged per reservation, night, room/bed, room/bed per night, guest, guest per night or quantity. Transaction code (Internal only, optional). Select when the add-on will be available (arrival, departure or both). 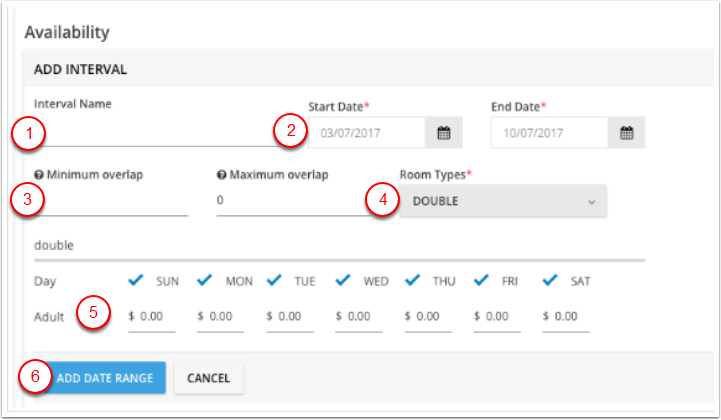 If "Not Applicable" is selected, it is irrelevant whether the guest checks in or checks out on a day that an add-on is available. 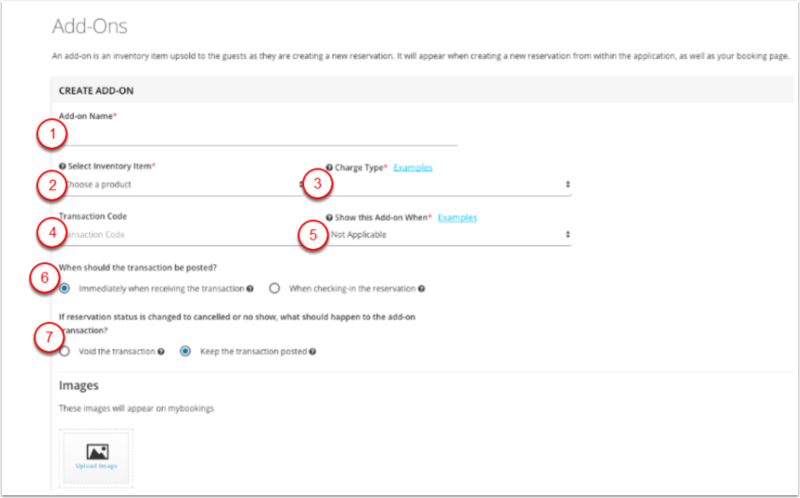 Select if the transaction should be posted immediately when receiving the transaction or when checking in the reservation. Choose if you want to keep posted or void the transaction in case of cancellation/no show. Set interval name, (internal only). Select the room types you want this add-on to be available to. Fill up with prices and day of the week that this service/product should be offered. In case you offer this add-on with a different price during the year, for example, you can simply add a new date range to set it. The Add-on will show up on the reservation page in the booking engine after confirmation.